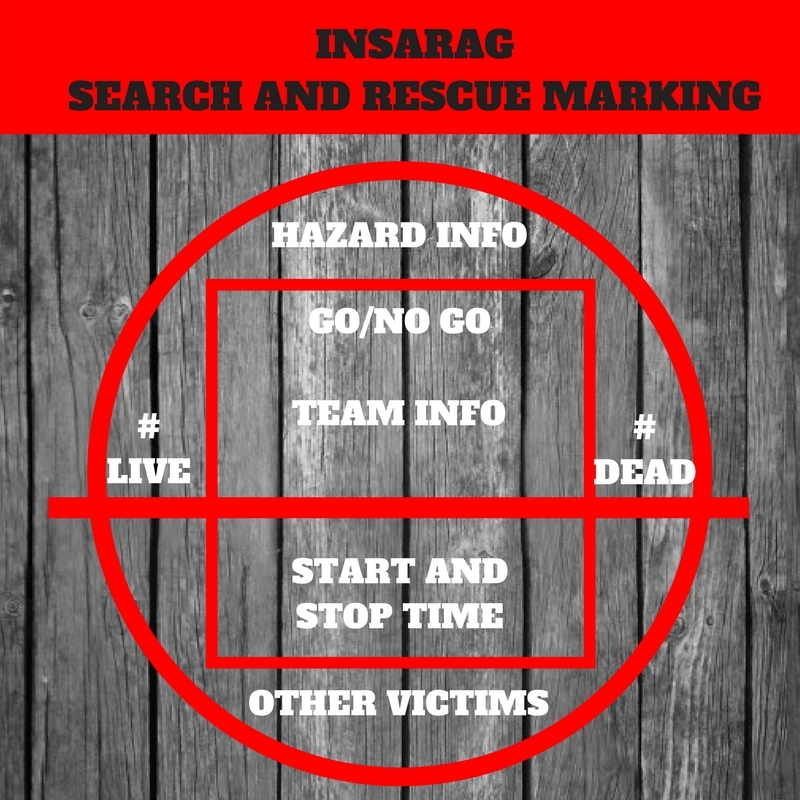 The International Search and Rescue Advisory Group (INSARAG) sends out guidance all over the world to standardize search and rescue procedures. If you are in the US, the FEMA markings would be more relevant. 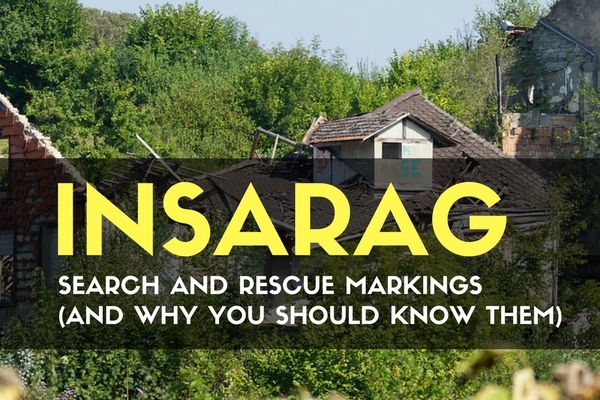 But if you are traveling to any other area of the world, or happen to live abroad, the INSARAG markings will be the markings of choice for disaster response teams. When disaster strikes, sometimes homes have to be searched and people rescued. Whether it is the military or a civilian organization, procedures are in place to make sure that the search process is thorough and efficient. One of the best ways to do both is to place markings on the actual homes being searched to let other responders know information about the building or area quickly. If you recognize the markings, you can tell whether a home is safe to enter, when a search took place, by who, and how many live or dead victims were removed. To start an INSARAG marking, you make a 1 X 1 meter square box (roughly 3’ by 3’) with spray paint near the front door or entry point. Write the team name and start time below that inside the box. Write the finish time of the inspection inside the box. Hazard information goes above the box and missing persons (if known) below the box. Live victims removed go left of the box and dead victims go to the right. When the search and inspection is complete, put a circle around all the information. When the team is certain there are no more victims, place a horizontal line through the circle and box. You can read these markings if you know what the different positions mean. You could know if an area has been searched, and specific numbers of people and victims evacuated. You could learn who is doing the searches and even how long it takes them to do one. The interesting thing about any search and rescue marking is that once you know how to read them, you could also choose to write them in extreme situations. Marking your home with the appropriate search and rescue marking depending on the circumstance could help you avoid encounters and ‘hide in plain sight’. Making your house to appear as if it has already been searched and cleared and/or too dangerous to enter could let your house be skipped over. This could help you avoid military encounters or being forcefully evacuated without any confrontation. If you do need help or assistance, it would probably not be wise to put a search and rescue tag at your front door. There are two types of search and rescue marking to use, and it is best to know both types. Their use is split up by geography pretty well, with the FEMA markings being used in the US. INSARAG markings are used in the rest of the NATO nations. If you live in or happen to be traveling to a nation with a different marking system, it would be good to know what the markings mean. If for some reason another country’s forces or search and rescue squads were working in a foreign country, they may still use their conventional markings. Knowledge can be a powerful tool when SHTF, and being able to avoid conflict and confrontation can be an invaluable asset. You can also learn about the US marking system, the FEMA Urban Search and Rescue Markings. While I would be much more likely to use these markings, the INSARAG marking system could still come in handy, even if you live in the US. Keep exploring, stay prepared, and be safe. Won’t FEMA be tracking “team names” and know if it fictitious? Reading these would be useful but creating your own with a fictitious team name could be deadly…? No, they won’t be tracking. They don’t have the resources. The National Guard will most likely be doing the sweeps, and they will be looking to get it done as quickly as possible. Marks will be done hastily and almost illegibly. As long as you aren’t using a crazy paint colors and ridiculous information, you should be able to come up with a tag that would not be scrutinized.